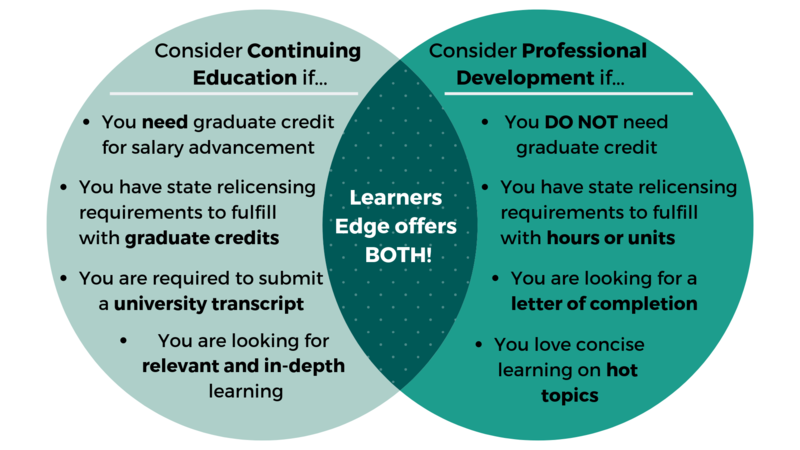 Below is a summary of how Learners Edge may help your continuing education and Oregon teaching license renewal needs. This summary should in no way release individuals from their responsibility of ensuring that the course they take meets their professional needs. We hope it provides assistance in understanding how Learners Edge might help you in the accumulation of clock hours or graduate credit for salary advancement and the Oregon teaching relicensure process. See the Oregon Teacher Standards and Practices Commission website for complete OR teacher relicensure information. The Professional Teaching License is issued to experienced teachers who have successfully demonstrated an advanced level of educator knowledge, skills and dispositions. The Standard Teaching License will be renewed as a Professional Teaching License. The Legacy Teaching License is issued to veteran teachers to recognize their long-term employment and experience in the public schools without obliging them to meet the new advanced competency requirements of the Professional Teaching License.